This article discusses the advantages and disadvantages of using Special Inks (also known as Brand or Pantone inks) compared to printing out of 4 colour Process (also known as CYMK) and how to decide which type to use. Firstly, we will define exactly what we mean by special inks and by four colour process. Special Inks are also known as Spot, Line, Solid, Brand or Pantone colours. For brevity, we will call them spot colurs. Spot colour printing creates brighter, more vivid results, but with a smaller colour range. When printing in single colours, a single plate is produced which takes up 1 unit of the printing press. A printing press normally consist of 4-6 units each capable of transferring a separate colour to the paper/board/stock as it is being fed through the press. Each unit requires its own plate. 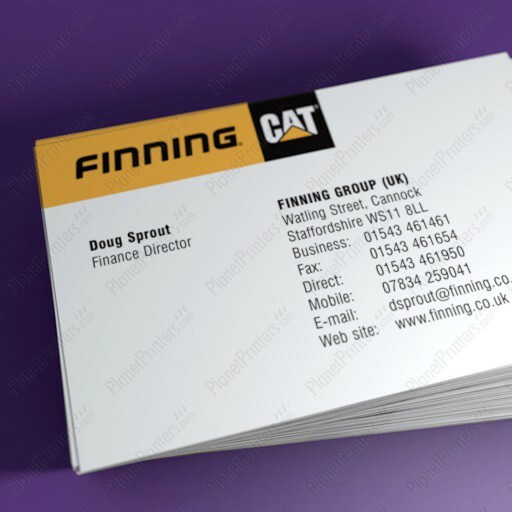 Spot colour printing would be typically used for jobs which require no full colour photos or pictures, such as for business cards and other stationery or where corporate colours are paramount. If you viewed a Spot colour printed item through a magnifying glass, you wouldn’t see any dot or screen overlaps of different colours. All Spot colours are catalogued by the Pantone Matching System (PMS), an industry standard for matching ink colours. 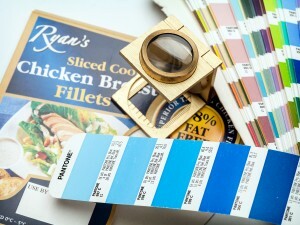 A Pantone book is used by all printers to match the colours specified by your graphic designer. 4 colour process is also known full colour printing or CYMK printing. 4 colour process is used for printing items that use “full colour” i.e. where colour photos, images or a colourful design is used. 4 colour process printing involves the use of four basic colours Cyan, Magenta, Yellow and Black, known in the industry as CMYK. The artwork is separated into the 4 basic colours and divided into tiny dots that overlap each other to produce the final colour. If you viewed a 4 colour process item through a magnifying glass, you would see the tiny dots which make up the images or text. The four CMYK inks are applied one by one by 4 separate in-line units on press. Each colour is applied to the board or paper one by one to produce the final CMYK print. If the job is a four colour process and one spot colour job, there will be 5 printing plates and an additional in-line unit is used. Should my Packaging be printed out Spot or 4 colour Process or both? The answer to the above question will depend on how important it is for your packaging to have an exact match to a brand colour versus the cost of doing so.The number of colours used in your packaging will obviously affect the cost of your packaging – clearly a two-colour job will be cheaper than a 4 colour process job or a 4 colour process with spot colours. However, in certain cases where a brand’s colour is extremely distinctive and is of great branding importance that a particular colour remains a vivid colour and has no variation whatsoever, then it may be appropriate to ask your graphic designer to set up the artwork using spot colours. How do I decide whether to use Spot or 4 Colour Process? To decide which type of printing to choose, it is important to involve your packaging supplier at the very start of your packaging buying process. This means before you engage the services of a graphic designer to begin to create artwork. This may counter-intuitive – surely the artwork must be created first? With any packaging design project, it is always good practice to speak to your packaging printer before you consult your graphic designer. This is because the most important initial issue regarding packaging is the packaging structure. This must be tested and approved before you approach a graphic designer looking for artwork creation. We can provide your graphic designer with a key line which is a detailed outline of the structure of your proposed packaging which they can use to create the artwork in the correct format for printing and folding your carton or sleeve. When the structure has been agreed and the keyline issued to your intended graphic designer, you can begin to discuss the proposed design with your graphic designer, marketing department and purchasing personnel. While your design is still at proposal stage, ask your graphic designer to give you the proposed specification(s) for printing quote purposes. At this stage, you can see what your designer is proposing – he or she may have proposed a simple 3 spot colour design or a design using 4 colour process and 2 or 3 spot colours. It is recommended that you get quotations from your packaging printer at this point to see what these options will cost. However, it is important not only to look at the cost but also at how you wish the printed packaging to look. At Dollard Packaging, we can help you by showing you samples of cartons we have previously printed from both 4 colour process or spot colours or a combination of both. Having seen these samples, you will be a in good position to decide whether it is worth investing in spot colours or whether it is best to ask your graphic designer to format the artwork to print out of 4 colour process only. Many graphic designers may naturally want to use spot colours to achieve an exact match. Augustina de la Plaza, owner of the Freelo design agency has written an article entitled “Why Special Inks are So Important for Packaging”. In this article she is in favour of the use of special colours in packaging. However, as with any project, all the important elements must be weighed against each other and a decision made that will be in the best overall interest of selling more of your products.